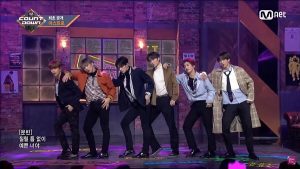 Did you miss the Best of Weekly Music Shows? I hope so because it’s back for another week of great performances. Twice made their highly anticipated comeback along with Astro, Loona Odd Eye Circle, Juniel, and old school group NRG. Produce 101 alums Hyeongseop X Euiwoong also made their debut. BtoB continued their winning streak for “Missing You”, which has a total of seven wins since promotions started. It’s a wonderful song, and the group earned these positive results. Congratulations! It’s hard to believe that we only have a couple of months left in the year. It’s been a really fun one, but we’re focusing on the past week here. I’ve picked a handful of favorites that appealed to me, but as always, we welcome readers to share their choices in the comments. Juniel looks like an actual angel amid the soft lighting and fluffy fog on the floor. This song fits those days of solitude when you’ve had a tough time and need relaxation. The set might be a bit too bright for the somber tune, but Juniel fits the role of comforter easily. This is going to sound corny, but she really is like a warm blanket on a cold day. The abrupt ending killed the mood slightly, yet I’d still listen to this when I need to feel better. It’s been a couple of weeks since their promotions began, and SF9 manages to perform as if it’s their first day. That’s something I truly appreciate about this group. Going on music shows weekly must be tiring for everyone, so I admire their consistent energy. With a routine like this, they need as much stamina as possible. There’s barely a moment of rest between steps, and they pull off their choreo so smoothly. BtoB are one of the most solid vocal groups in K-pop. I prefer their ballads over their pop songs simply because I love hearing them sing. These men never fail to harmonize beautifully. Eunkwang‘s ad-libs sent chills up my spine. Ilhoon and Peniel‘s raps were just light enough to fit the tone of the song. By the end of the performance, I was waving my hands slowly in the air. When it comes to certain gimmicks, a group either nails it or suffers first-hand embarrassment. The Superman concept works here. MASC demonstrates how heroes can wear capes, sing, and dance at the same time. I love the transformation throughout the routine, and the guys pull of their characters well. It’s the kind of thing we’d never see in the U.S., which is a shame since some artists could use a lot more fun in their performances. Another favorite from this year’s KCON in LA, I expect nothing short of spectacular from this group. As always, they delivered with sharp moves and a cool charisma. This group should get a lot more attention for their clean choreo execution, and I’m confident they’ll grow in popularity with this level of talent. It may be too much to hope they return to KCON LA for a third consecutive year, but I honestly don’t care — I just want them there.